Just back from seeing the latest take on Sherlock Holmes at FACT in Liverpool. The city was very quiet tonigh with lots of restaurants shut and hardly anyone around the city centre. 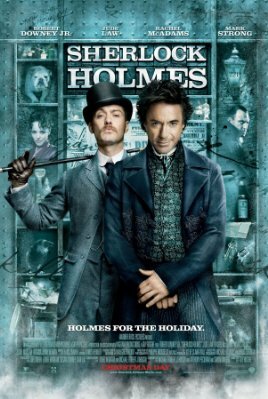 This take on Sherlock Holmes is a little more spirited and while not overtly steam punk certainly has something of that genres sensibilities about it. Robert Downey Jr. is an excellent choice to play the great detective. He manages to incorporate wit and confidence alongside despair and failings without getting lost in either side of Holmes. Jude Law plays Dr. John Watson in many ways more closely to the original character than some of the older film incarnations. Watson is an intelligent, resourceful character who isn’t averse to the application of violence to achieve his ends. The two actors have a good degree of on-screen chemistry with a definite spark to their verbal sparing. Rachel McAdams’ Irene Adler is good, Mark Strong’s Lord Blackwood is suitably villanous, Eddie Marsan’s Inspector Lestrade and Kelly Reilly’s Mary Morstan suitably an English rose with a bit of fight in her. However they really don’t get a huge amount of screen time. The adaption has a wit about it and keeps up a good pace. Some reviews I’d read seem to have based their feeling about the pace on deadly 1960s TV versions and older film without bothering to reread the stories which frequently move along quite quickly once the game is afoot. I’m not expert on martial arts but I had a feeling that Holmes was using Bartitsu which, if true, is an amusing historical detail. The visuals are well assembled with something of the theatricality of Sweeney Todd: The Demon Barber of Fleet Street without slipping into Sin City graphic novel style. Guy Ritchie’s fast cutting style is well used to add to the feeling of pace. The music complements the pace and style of the film. The end title designs are pleasing and quite a few people stayed in their seats for them. Some purists may not like this take on the Great Detective but I enjoyed it. The film didn’t just hint at a sequel so much as lay out the protagonists on a plate. If it’s as good as this version I’m looking forward to it.